LankaClear, the operator of LankaPay – Sri Lanka’s national payment network, has organised the LankaPay Technnovation Awards 2017 – Sri Lanka’s first and only payment technology innovation awards, scheduled to be held on 20 June at The Balmoral, The Kingsbury Hotel. 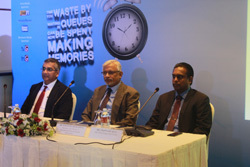 To drive financial inclusivity in the country by enhancing the efficiency of the national payment network and propel the use of electronic transactions, the awards kicked off with a press conference held on 1 June at Hilton Colombo Residences. The LankaPay Technnovation Awards will recognise member banks and non-banking financial institutions that have been steadfast to the cause of using innovative technology to promote digital transactions and exceled in this endeavour.